PortableApps: your applications, your settings - anywhere, on a USB key! Do you find yourself frustrated when on the go, without all your applications and data? Copy the PortableApps software suite to a USB flash drive , iPod, or similar device, plug the unit into a PC, and all your apps–plus your contacts, documents, and bookmarks–are available. I move from computer to computer a great deal (I mean PCs, even though I’m investigating on similar Mac-based solutions). More often than not, the computer I’m at doesn’t always have all the software I might need. It’s not always possible to just go and install anything I fancy on any machine I happen to use and this is where Portable Apps comes to the rescue. It comes handy too now that Netbooks are becoming so popular! Portable Apps Suite is effectively a wrapper for a number of very useful applications that can be installed on a USB flash drive (or any USB storage device, for that matter). To fire it up, simply double-click the StartPortableApps.exe on your USB device and you’re greeted with a nice little menu, similar to the Windows Start Menu, as can be seen on the screenshot above. PortableApps Suite (Standard Edition): ClamWin Portable (antivirus), Mozilla Firefox – Portable Edition (web browser), Gaim Portable (instant messaging), OpenOffice.org Portable (office suite), Sudoku Portable (puzzle game), Mozilla Sunbird – Portable Edition (calendar/task manager) and Mozilla Thunderbird – Portable Edition (email client) and runs comfortably from a 512MB drive. 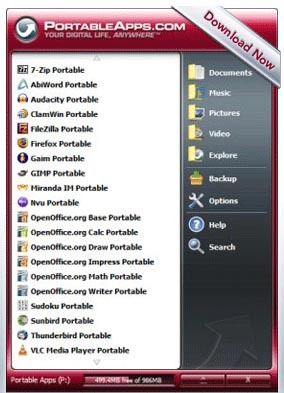 PortableApps Suite (Lite Edition): Uses AbiWord Portable (word processor) instead of OpenOffice.org Portable and runs comfortably from a 256MB drive. PortableApps Suite (Base Edition): If you’d like to pick and choose exactly which apps to include, you can try Portable Apps Suite (Base Edition). This is a stripped down package with just the PortableApps Menu, PortableApps Backup utility and custom folders, icons and autorun. It’s less than 1MB installed, so it’s a great option for smaller drives.My base download was the Standard Edition, to which I’ve added FileZilla, Nvu Portable, KeyPass and one or two others on a Kingston 8 GB .The usefulness of this application cannot be stressed enough. I don’t find many things more frustrating than when I need to go and change something on a computer I don’t normally have access to, only to find that my preferred software is not available. Now it’s simply a matter of popping in my pen drive and selecting the desired application. Nothing could be simpler.To download any new applications, you simply download the executable, then select “Install a new app” from the Suite’s menu and select the new application. To “uninstall” an application, you only need delete the directory from your pen drive. If only all application installation/uninstallations were this simple! You are currently browsing the archives for the Portable Applications category.